In policy news, things are moving at a slower, more measured pace. Moreover, the policy pendulum is swinging back to a more moderate place. In a move striking many as too little too late, the House GOP has proposed adding $15 billion to their now failed ACHA (American Health Care Act) making it more palatable to centrist republicans. This money would be pad to reimbursing health insurance companies for high cost patients. The intention is that this would help states reduce health insurance premiums for clients starting in 2018. The Kaiser Family Foundation has estimated that health insurance premiums will go up for the average ACA (Affordable Care Act) client by 19% if federal subsidies are withdrawn. Even with this 15 billion dollar amendment, the GOP did not have enough votes to pass their bill, and now Congress has adjourned for spring break recess. According to the Gallup poll, the majority of Americans now support the ACA. This is now the case for the first time since the ACA became law seven years ago. Though 55% of Americans now support it, many feel it could be improved. Centrist Democrats, calling themselves the “ New democrats” and moderate Republicans, “the Tuesday group”, are beginning to work with one another on small feasible improvements to the ACA which could benefit everyone. Senator Bernie Sanders has promised to propose a bill for a single payor system, the so-called “ public option”, also known as “Medicare for all” in 2018. Sixteen State’s Attorneys General have filed an Amicus brief against a new Ohio law which prevents health care providers who offer abortions from receiving any federal funds for any services. A US District Judge in Missouri has reversed a similar law in Missouri. In other abortion news, the 2013 Texas House Bill 2 required doctors to have admitting privileges in order to provide abortions. It also required them to do so in ambulatory surgical centers. Finally, it decreased the limit from 24 weeks to 20 weeks. The first two requirements put many midlevel providers in office settings out of business. About half of all abortion providers were put out of business. A new study in JAMA, the Journal of the American Medical Association, looked at the changes in practice since this law has taken effect. It turns out there were 20 % fewer abortions performed in that time frame. It also turns out that the abortions performed were done at a later gestational age. The researchers also calculated that an increased umber of abortions were performed illicitly. In medical news, the WHO (World Health Organization) has data indicating that fully 10% of all deaths worldwide are due to smoking. The number is believed to be underestimated since the effects of second hand smoke have not been accounted for. Death rates from the main types of cancer for all types of people have declined between 2010 and 2014. The decrease washout 2 %. Looking back at Zika, new data has shown us that 10% of women with Zika infection in pregnancy had a baby with a serious birth defect. The number may be higher since not all babies born to mothers with Zika have been given neuroimaging. Also in Zika news, a vaccine under development is progressing to phase two testing. In other vaccine news, according to the CDC, as of 2014, about 42% of all people carry the virus. A large new Scottish study of 20,000 women has shown that the HPV vaccine has been associated with a 90% fall in the prevalence of the virus. Stay tuned for more breaking news from the exciting world of Ob/Gyn here, next week on Medical Monday. Thanks for your patience with my delay during Passover ! Here is may first ever angel food cake, made gluten free from scratch. 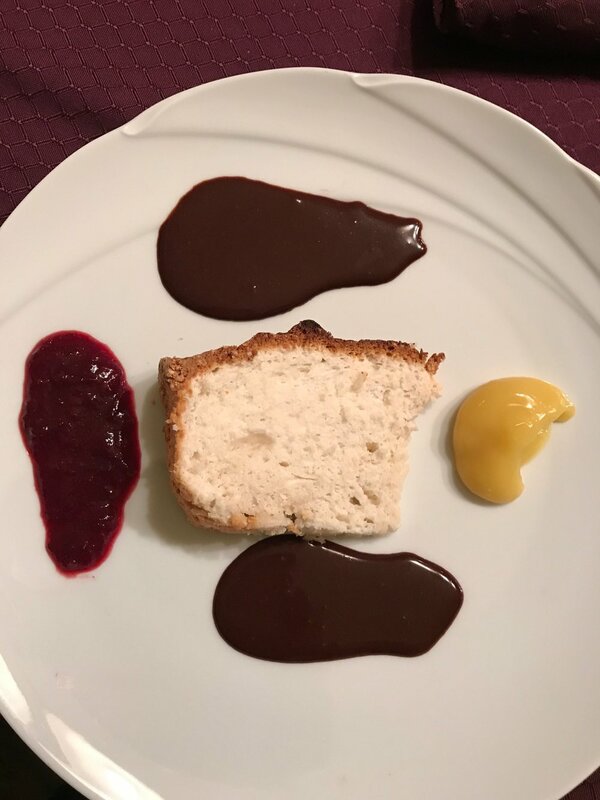 It is served with a dairy free chocolate ganache, lemon curd, and cherry berry sauce. Ebola is on everyone's mind. Worldwide the death toll is approximately 2000 people most of whom were in West Africa. People are not aware that it is not easily spread. The odds of getting it in United States are vanishingly small. Sadly there is not yet any vaccine for Ebola. 9,700,000 children under five per year die from preventable disease. 250,000 per year, probably more from flu or flu related complications. Now let's consider our little corner of the world, Montana. Flu season officially started at the end of September. This year Montana has had 5 confirmed cases so far. However, in the previous reporting year we had a total of 3192 cases, 313 hospitalizations and eight deaths that attributed to influenza, with the bulk of cases being in December and January. What about Montana's other common preventable infectious disease ? It's Pertussis of course. It is also known as whooping cough. However in the previous reporting year we had a total of 661 conference cases. There were 361 hospitalizations and 15 deaths, mostly of people over 65. Our scourges, flu and pertussis, are vaccine preventable diseases. What about theGuillain-Barr syndrome (GBS) , or temporary paralysis ? It too has been studied and it's incidence in the US is around 3000-6000 cases per year whether or not a vaccine was or was not received. It has been determined that one is much more likely to get GBS after flu than after a flu vaccine. As I look at the disease rate time charts for prior seasons of each of these vaccine- preventable diseases, I see that we are right ahead of the big bumps in numbers of cases. I hope we get ahead of the curves this year. Pertussis and flu vaccines are available everywhere now.